Highlands plasterer judged best in State. Again! Bowral plasterer Harold Scheibel of Scheibel Plastering has been honoured in the 2004 Wall & Ceiling Industry Awards. The awards which recognize excellence in the wall and ceiling industry were presented at a gala dinner held at the Novotel in Brighton Le Sands last Friday night. 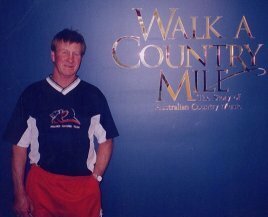 Scheibel's award was "Best in Community Projects" category and was won for the specialised work he and his men did on Tamworth's "Walk A Country Mile" museum. 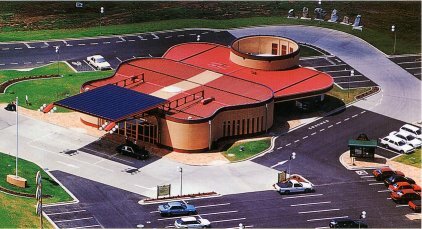 The exhibition is within the Tamworth Visitor Information Center and displays the history of Australian country music. CEO of Tourism Tamworth, Dean Belle said he was delighted and proud that the project won the award. "I'm sure it's the first of many awards, "Belle said, "we set out to achieve something special, something intriguing, entertaining and informative and we're thrilled with the results". This is the second time Scheibel Plastering has been judged the best in the state. He won the overall prize for excellence in 2002 for his work on actor Noeline Brown's house in High Range. "It's a great honour to win again," Scheibel said,"especially for this project which had to be completed within an extremely short time to coincide with the start of the 2004 Tamworth Country Music festival." Designers of the "Walk A Country Mile" project, Tony Saltier and Craig Pattinson of the Wintergreen Arcoessence Group earmarked Scheibel for the project almost before the drawings were complete. "We've worked with Harry before," Saltier said, "he's the best. ""It was a highly complex job," Pattinson said, "there were curved walls and ceilings around every corner - we had to have great carpenters framing it and then the very best plasterers." Saltier and Pattinson have recently completed the design work on The Slim Dusty Centre - a multi-million dollar museum about Slim's life and music. ©Copyright 2005 Scheibelplastering.com. All rights reserved.